Flower Window Boxes is a custom fabricator of custom cedar corbels and other decorative wood accents in architecture. 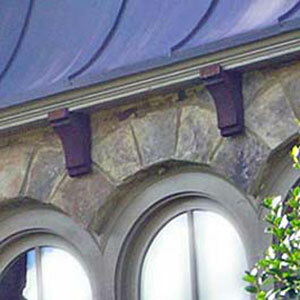 Our selection of architectural corbels is just a small sampling of what we do. Customers often call us for free quotes on custom corbels from blueprints or for pricing to modify dimensions of one of our existing corbel brackets. All of our architectural cedar products are built to order and usually in 3-5 days. Decorative or structural wood corbels can be used to enhance eves in colonial, Victorian, and Craftsman style homes to name a few. Cedar is an ideal wood due to it's ability to resist rotting and is available in smooth form for easy painting or rough form for a great natural look. You can make this selection on the product page of each product where more details are given. Wood corbels are available in most sizes. Because they are cut from dimensional lumber there may be some limitations for overly sized brackets and they may be made from laminated beams. If you are a builder, contractor, or architect be sure to bookmark us for all of your future cedar millworkneeds. Please click here to fill out a free estimate or if you have questions about any of our products.